Well im back from a hike i did,and there i got a chance to do a little test and take some "how-to" pictures for your eyes,later on i wil add a short video film here and to youtube where i show the use of these cool light weight food & drink heaters. First you just pick up the food you want to eat,and one of HOT PACK heaters. 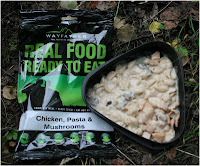 Chicken,pasta & mushrooms.Wayfarer is one of my favourites as it resembles those used by US military forces MRE ration packs.It does NOT need any water to be added,and it can be eaten cold too but it makes it digest and taste even better when warmed up.If you have one of those meals that need water,make sure you can close up your food pouch after you have added the water,since these heaters work best when theyre laying flat on ground,or roc or something. If you cant close the pouch,make sure you put the meal,inside the Hot Pack,in a way it really stands against some support,tree stum or some similar.And it aint so effective when its standing,ive noticed,but still better than eating cold foods,especially those that require water,theyre bit hard to chew :). Anyway,then you drop the meal that is in its own pouch,into the hot pack,and see that the clothbag in the hot pack,will be between the meal and ground/support,it heats up the portion better this way as the heat rises up to the meal,and wont escape,as it would do if its on top of the meal. Then,you poor about 45 milliliters of water from your container to the heater,it has also been clearly marked where you stop pooring,as its bit hard to measure that amount in the woods if you dont carry a mug or something with proper measurements in it. After this,just close the leftover part of the pouch that doesnt cover the meal pouch,use it like a lid/flap,to seal up the package,but DONT use any heavy items to make it 100% leakproof,this thing becomes VERY hot,and generates hot water steam,for quite a while,amd if its sealed up with tape or something,it might blow up.As long as you remember this,and that the package is laid flat on good surface ( it wont start a fire though,dont worry),youre doing just fine and its safe to use,really. Let the whole package be there,for some time,from 7 to 12 minutes ( to my experience,this is),and then carefully pick it up,rip away the second marked part of the pouch ( this eases out removing the hot meal inside the hotpack).Be careful,the package can be still quite warm,use gloves if you want.Remove the warm meal,in this case you need just to open up the wayfarers factory-closed bag,check out that its warm,and start to eat straight from the pouch or poor the meal into your plate of choise,and enjoy. MAKE SURE YOU GET RID OFF THE GARBAGE PROPERLY,DONT EVER WASTE NATURE. Its pretty odd you if you dont have the muscles to carry away the empty cans,pouches,packings if you had the energy to carry them along in to the woods. Hot Pack has instruction for its use written on it very well,now in finnish too,which is great for us. 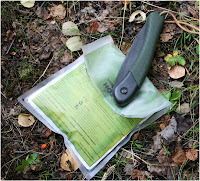 I found out,during our short trip,in our natural park,the Hot Pack,very useful and easy way to heat up the meal,so did my buddies,especially i noticed that my brother really liked it,as hes a beginner and does things on low budget intentionaly,and reduces weight of gear too,if he can.So this is also lightweight method to do food,and offers an low-cost way to get started your hiking and outdoor activities as you dont Have to buy any gas cartridge or liquid fuel operated stoves at the first point at all.And even later,im goin to carry these,cause they work well in cold climates too,where the gas stoves arent best things usually to carry around.And hey,it wouldnt be bad idea at all to add these into you cars emergeancy kit,not to mention other just-in-case uses,in boats,cottages or anywhere.These pack up in small space and dont cost much,think about it. My brother who is on novice-level when it comes to outdoors living,rated this the best stuff he had eaten on trails this far,and if youd know him,you would be sure that the meal cant be bad as this guy is picky one and eats a lot in restaurants etc. Both,the Heat Pac´s and Wayfarer rations along with many other food items can be found from SOLUTION FOODS webshop. And as i said,i will be adding some short video clip as i get it edited,and few other meal tests here pretty soon,im bit busy now as im havin quite a lot of jobs,school classes and one trip in nearby future. Hope you liked this one ! ?